Takeaway: Predictive modeling is a useful tool to help forecast and prevent accidents in the workplace. By looking at past and present data, you can accurately determine where you should focus your incident prevention initiatives. Companies rely strongly on their knowledge of past incidents to keep their workers safe. Learning from them and trying to correct their safety programs accordingly are critical steps for workplace health and safety. This, however, is completely reactive in nature and ignores the more proactive steps that could be taken. While reacting to incidents is important, your safety program won't be extremely effective unless it also makes use of predictive modeling. Predictive modeling is a process that takes data, analyzes it, and then forecasts future events, completed with probabilities, based on that information. Predictive modeling is used in weather forecasting, insurance, and healthcare, but it is also a great tool for predicting workplace incidents. Predictive modeling gives you a snapshot of the future by analyzing a combination of historical data (prior incidents) and present-day safety measures. With this predictive capability, you can narrow your focus, target newly identified problem areas, and prevent future incidents and accidents. How Does Predictive Modeling Work? Predictive modeling works by looking at many variables from the data collected. There are two main types of data that can be analyzed to predict workplace incidents: lagging indicators and leading indicators. These indicators are ultimately symptoms of hazards present in the workplace. Just like a doctor would address symptoms a body was having, so you should take a closer look at the indicators of hazards in your workplace. Lagging indicators are reactive in nature, meaning they're indicative of safety issues. While they can serve as useful data points, you don't want to have too many of these because having a large amount of this data reflects having a large number of incidents in your workplace. While lagging indicators can be useful in showing where a safety program is lacking, it is often better to be proactive, which brings us to leading indicators. Leading indicators are proactive in nature. These are the steps that are taken to prevent future accidents. 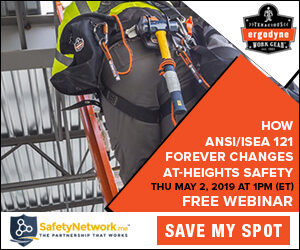 They can be easier to miss than lagging indicators because safety professionals who aren't performing in-depth inspections could overlook underlying issues. You might have already gathered and stored this information somewhere, but that's not the same as getting the most out of it. You can't afford to just wait around for another incident to happen. Instead, analyze the data you have on hand and see what it reveals. Here are some real life examples of predictive modeling put to good use. Certain jobs leave workers with a higher risk of developing musculoskeletal disorders (MSDs). These disorders come on gradually, so it's not always easy to identify what exactly causes them. There are, however, certain factors that can make them more likely to occur, such as repetition, awkward postures, and vibration (learn about The 5 Key Ways to End Up with a Musculoskeletal Disorder). Certain personal characteristics, moreover, can increase the risks. Older age and obesity, for instance, both make workers more susceptible to MSDs. With predictive modeling techniques, these factors can be identified and analyzed, resulting in a clearer picture of which segment of your workers is at higher risk of MSDs, allowing to develop a finely targeted plan to prevent them. Safety inspections are a vital component of any safety program. By assessing the safety in the workplace on a regular and frequent basis, you can remain aware of how well the safety programs are doing and stay on top of potential issues. Studies have shown that the more inspections a company performs, and the more people they get involved in these inspections, the safer their workplace is. Additionally, companies who have safety audits come up clean – in other words, have no safety issues time after time – actually have more workplace incidents. Having a “continuous improvement” mindset will help find issues in every safety inspection. Just because there are no incidents on the surface doesn’t mean there aren’t underlying problems that could surface. Always look for ways to improve. Even broken down and explained, predictive modeling can still seem like a harrowing task. Luckily, there is software available to help predict future incidents in your workplace. By inputting data from inspections, this software can highlight potential issues for you, analyzing your data so that you can spend more time fixing issues and less time worrying about where your hazards are. Predictive modeling can show you where to focus your attention and help you forecast future safety incidents. You still need to be proactive, however, and use the data to implement the right procedures and standards. We can predict the weather, but it won't do much good unless you remember to grab your umbrella when it calls for rain. It's the same with using safety software: the data can help you draw conclusions but you'll have to implement new processes and safeguards. With a better forecast and a readiness to take proactive measures in light of the data, you will be able to make your workplace a much safer one. What is the difference between a safety officer and a safety engineer?